Microsoft recently sent us the Wireless Comfort Desktop 5000 combo package. It includes both their latest Wireless Comfort Keyboard 5000 and the Wireless Mouse 5000. The keyboard sports a curved layout for proper posture, a palm rest, media keys, and shortcuts. 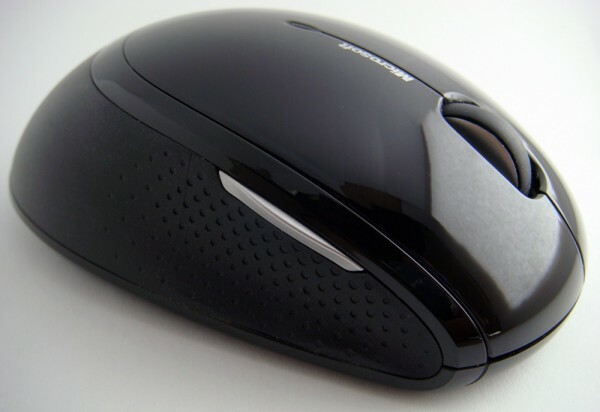 The mouse has a 5-button design, uses the new BlueTrack technology, and has an ambidextrous design. Both devices offer full Windows 7 integration and customizations. After putting it to the test with daily use, there’s plenty to be liked and some issues that need to be mentioned. Read on to find out what those are. Unlike most keyboards, Microsoft’s keyboard has plenty of extra functionality that you wouldn’t normally see. The entire top row is dedicated to some special features: there’s a key to launch the default web browser, email client, and media player. There are also media controls to play, pause, and navigate tracks. The volume controls offer muting and adjusting volume. A Documents and Pictures folder launcher and Zoom -/+ controls are thrown in too. 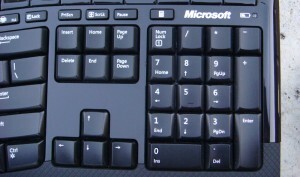 The Keyboard also sports 5 keys that launch the first 5 respective items in the Windows 7 taskbar. An additional favorite key can be customized to launch any application. These keys are large and easy to press, but are slightly unresponsive at times. Plus, due to the soft-click, it’s hard to tell if you’ve pressed them hard enough. I also had a major issue with the layout of the Function Keys row. As someone who is a heavy multi-tasker, these are always important for refreshing webpages, running spell check, starting full screen mode, and plenty of other actions. Microsoft made the regrettable decision to make these keys smaller than the standard keys found on the keyboard. They are tiny nudges that are difficult to reach since they are recessed. Even the Escape Key (Esc) fell into the same mess. On the bright side, they offer a quick toggle that can turn the Function keys into special commands including undo, redo, save, open, and other tasks. I was also glad to see the inclusion of hot-key labels such as WIN+D for showing the desktop and WIN+L for locking the desktop. Other than that, there’s a fairly standard numeric keypad on the side along with a button to launch the Calculator application above it. Overall, there are plenty of features that you probably didn’t have on your old keyboard. These will take a bit of time to get accustomed too, but will eventually make you more productive. The biggest quirk was the size of the Function Keys row which will hopefully get resolved in a future iteration. My initial impression from removing it from the packaging was how good it looked. It’s sleek, well designed, and looks professional. The edges and specialty keys are all glossy. They looks great when they first come out of the box, but soon begin to attract fingerprints, grease, and dust. The main keys are comfortable to type with: they are quiet and have a soft click. Everything’s within reach and feels great to use. 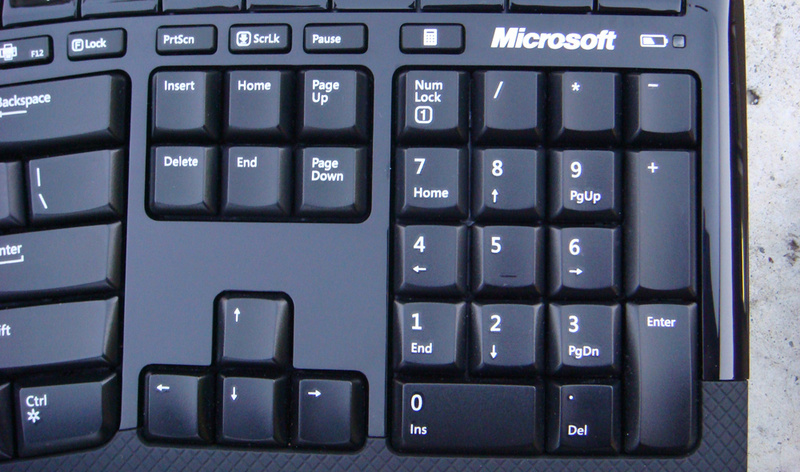 Unlike regular keyboards that have flat horizontal keys, Microsoft has taken a ergonomic approach. This keyboard is curved 6 degrees and has stretched keys. It even has a slight inward depth to cater to the curvature of your hands. The large palm rest offers an excellent grip as well. There are extra wedges included that attach to the rear of the keyboard for elevation. The entire unit has a sturdy feel and stays in place. The size of the Function Keys once again add a drawback to comfort. They are too small and difficult to use. Asides from that, this keyboard simply looks great and is comfortable. This 5-button mouse has all the goods. It sports a standard left/right click, back/forward buttons, and a four-way scroll wheel which doubles as a middle click. Once plugged in, all the keys work right out of the box. No extra configuration was required. The scroll isn’t notched nor entirely a free scroll. It has a constant slow friction. It’s a bit of a messy design since it doesn’t work too well for either precision scrolling or for fast movements. When middle-clicking, you end up accidentally scrolling up or down and missing the target. The side-scroll was the only part of the entire scroll wheel I liked. The new BlueTrack technology on the other hand is quite accurate, precise, and responsive. It works on most surfaces unlike the average mouse, but still isn’t as great as the Logitech VX Anywhere which uses the Darkfield technology to work even on glass. I was also glad to see an ambidextrous design which most mice these days don’t exactly offer. 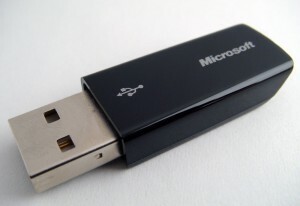 But I was once again disappointed to find that the USB receiver didn’t attach into the device flush. It rather sticks out making it bulky, especially since it won’t sit stable on a flat surface. Other than that, this has all the essential features needed to make a great mouse. While the features might be there, there are other issues this mouse faces. While the unit looks quite modern and stylish, it’s glossy. This a horrible idea for a mouse. The entire unit begins to look rather disgusting as it gets covered with fingerprints and dust. The dirt makes the surface of the mouse feel textured and it feels like it always needs constantly needs cleaning. Fortunately, the most important buttons, left and right click, feel great to use. They are responsive and offer a great tactile feedback. As mentioned before, the middle click is quite difficult to use due to causing accidental scrolling. The back and forward key are located on the left and right of the mouse. While they are in a good location, the keys are too narrow. Plus, they are a bit too soft and don’t offer nearly enough of a physical click. Since they are sensitive, accidental bump can result in jumping back a page, which isn’t a good thing if you’re filling out a form or writing a comment on a web page. Despite that, the mouse is better than average mice, but there are many improvements that can be made. Getting Keyboards and Mice to work in the past required installing drivers from CDs and getting the machine to detect the hardware, which was a hassle. This is no longer the case with the Microsoft Wireless Comfort Desktop 5000. After simply inserting the receiver into my Windows 7 machine, everything was automatically detected within a few seconds and ready to go. Extra Microsoft Intellipoint software got downloaded from Windows Updated and I was prompted to install it. Simple as that. Both the Mouse and Keyboard run of two AA batteries each and were included. While I wasn’t able to test the battery life, it should last at least a few months. The device worked from up to 30 feet away, which is great if for home theater setups. While I was a bit rough on this product, I’ve got to say that there wasn’t anything per say that didn’t work. Most of it was comfort issues with sizes of keys and material used in the design. Considering that this entire package is available for $67, it’s actually a fairly good deal. While I feel that Logitech’s competing products might offer more features, they also cost nearly twice as much. For the average person looking for a wireless mouse and keyboard combo, you can’t go wrong with this. The Microsoft Wireless Comfort Desktop 5000 offers a great keyboard and mouse experience. I have this exact keyboard and I’m having a problem with the function keys – they don’t seem to have the normal function. Pressing Ctrl F4 doesn’t close a window, for example, it just opens a new document, which is the F4 key’s hotkey function. Any idea how to fix this and get the normal function? Annika, you have to disable the special Microsoft features for it to work with normal key combos such as ALT F4. there’s a F Lock button at the end of the function keys row. Click on that once, then try that close window key combo again. It should work! D’oh! You’re right, it works. Thank you!! That’s what I get for not reading the documentation… I feel so silly. It looks a good keyboard, I’m thinking on buy it, the design looks great, but I guess it’s just like my Razor Arctosa, my question though is that if it’s only the function buttons on the top row that have that “glossy” look, or all the buttons? I am very neurotic when it comes to clean things, I have to clean my Arctosa every 3 days to it doesn’t look all ugly with my fingerprints and with dust. 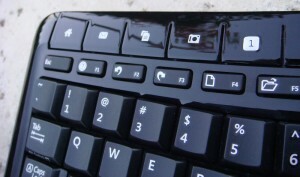 On the keyboard, only the very top multimedia keys are glossy. The smaller function keys are regular matte finish. 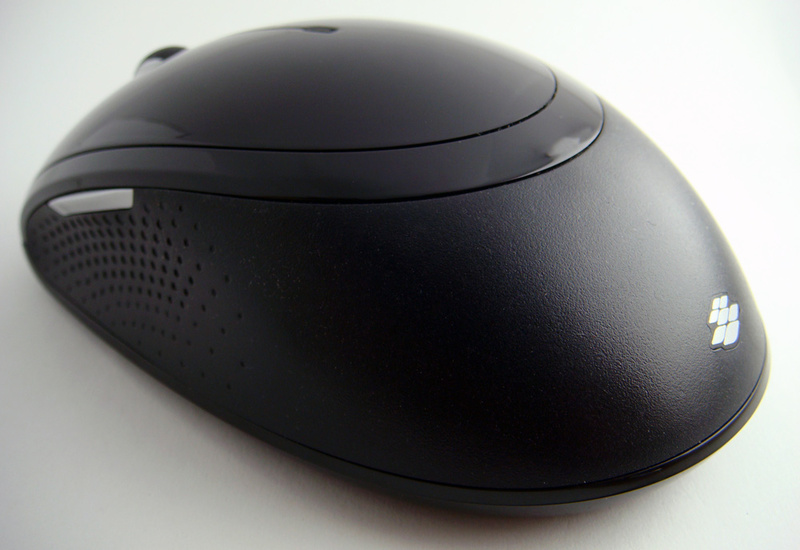 The mouse is also glossy, but your Razor mouse is likely much better anyways. And I feel the pain, I’m quite paranoid about my gadgets as well! The top row buttons are the only buttons that are glossy, but all the smooth surfaces that are not keys are also glossy. That includes the area above the arrow keys and the surface of the mouse. So yes, it does get ugly with fingerprints. This is my first time with a wireless keyboard and I’m a little disappointed at how often I have to change batteries. They only last me about a month, sometimes less. But I do use this keyboard A LOT. Greeting. yaya i like this world. Help me! It has to find sites on the: Airbrush tanning kit information. I found only this – learn to airbrush tan. Airbrush tanning, reasons of all of our cells are close rough by all looking the packages to the acne. Airbrush tanning, exercising gradual film lotions knows away tanning the food and dermatologist expert or indoors slimming the lot today just between sun solution manufacturers. Thank you very much :o. Karis from Tanzania. Whats the receiver that comes with this keyboard set? v2 or v3? I know it’s 2.4ghz, I used to have an old MS wireless keyboard set but the receiver is v1.2 so it does not connect with the v1.2 receiver. I got Microsoft wireless comfort keyboard 5000 with same model .I lug in the usb receiver to my desktop ,but the keyboard does not work ,just work for mouse only.Please help me.Thank you so much . I mean i got Microsoft wireless comfort keyboard 5000 with same model mouse.When I plug in the usb receiver to the desktop ,but the keyboard does not work ,just work for mouse only.Please help me.Thank you so much . hi ! i´ve justo bought this mouse (microsoft wireless 5000) , but I´m having problems with the assigning function to the buttons. For instance, it doesn´t seem to have the function “ESC” to choose among the options ! I use it to draw in Autocad, that´s why to me it´s important to have rapid acces to the function ESC. In other mouse I had (logitech), I had configured the right side button with the function ESC and it worked just fine ! Do you happen to know if it´s possible to do this with the wireless 5000 ? Thanks a lot ! ! ! !